For whatever reasons, investors don't seem to be giving these promising companies their due. By definition, if you're trying to beat the market, you need to develop a variant perception. In order to do this, you need to focus on situations or information that the consensus view is under-weighting or ignoring altogether. 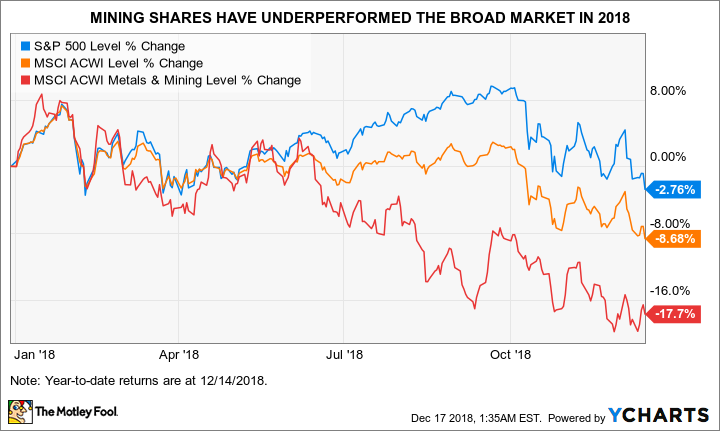 This week, we look at a pair of stories highlighting two categories of companies that have underperformed the broader market in 2018 to such a degree that they may present opportunities for value-conscious investors: megacap banks and miners. Then, we'll consider one small-cap industrial company with a turnaround story that the market appears determined to ignore. The reversal in animal spirits [with respect to the shares of the top 6 banks] cannot be understated. The one-year forward earnings estimate for the group has jumped 19-36 per cent in 2018. As such the fall in stock prices implies a contraction in their collective forward earnings multiple of about 40 per cent. All six banks are cheap, trading at or below 10 times earnings. Goldman has fallen to just seven times. Returns on equity for the group in 2018 have comfortably ascended into double digits even as price-to-book values fall. Personally, I am biased against pure-play investment banks Goldman and Morgan Stanley, because I believe they're managed principally for the benefit of "internal shareholders" (i.e., employees), without much regard for outside shareholders. Consider Wells Fargo instead. Yes, it is has received more than its share of negative headlines over the past couple of years (deservedly so) due to a sweeping fake-accounts scandal, among other issues, but it is addressing those problems. Earlier this month, for example, the Wall Street Journal reported that the bank is firing roughly three dozen district managers citing oversight failures. Wells Fargo is currently operating under a cap on total assets until regulators are satisfied that it has implemented the necessary controls to prevent abusive practices, which may help explain the discount the stock exhibits relative to peers. At Friday's closing price of $46.54, the shares -- down 23% on the year -- are valued at just 9.1 times next year's earnings-per-share estimate, with a rich 3.7% dividend yield. Mining last week's press turned up another potential nugget of under-appreciated value, courtesy of the Financial Times' Tail Risk (subscription required), which highlighted another industry that the market is (allegedly) punishing for past sins: Miners. So much has changed in the sector. [During the boom years it] was all about market share, being the biggest company possible There was very little discussion around what value we were creating for shareholders... [Mining shares are trading] at incredibly compressed valuations. People just don't believe that this change is sustainable. Mining companies -- and their investors -- were badly burned following the last commodities boom, during which an obsession with scale and market share had them committing malinvestment on a gargantuan scale. However, the number of deals in the sector is at it lowest level since 1995, per Dealogic. The return of discipline in capital allocation deserves some recognition from investors. On the other hand, I think there are good reasons to impose a valuation discount on the sector. In particular, I don't like the standards of governance: Like investment banks, I think miners are managed for their employees, with a lack of regard for shareholders. Take Glencore (NASDAQOTH:GLCNF), for example (which I highlighted in August 2015). Earlier this month, its head of copper marketing, Telis Mistakidis, announced that he would retire at the end of year. He joined Marc Rich & Co. (Glencore's predecessor) in 1993, and now owns 3.2% of the company -- a stake valued at $1.67 billion. By comparison, Jamie Dimon who has led JPMorgan since 2006 has a 0.22% stake (and a dollop of options) valued at $832 million, according to data from Bloomberg. Under his leadership, JPMorgan's market capitalization has increased by nearly $200 billion, or nearly four times Glencore's total market value. We started with megacap banks, which isn't a traditional "under-the-radar" hunting ground, so we are ending with an area that is truly overlooked: The small-cap industrial sector. Last Wednesday, Barron's touted (subscription required) Milacron Holdings (NYSE:MCRN), a leading provider of the technology for manufacturing and processing plastics, with a market capitalization of $896 million. The company filed for bankruptcy in March 2009, one day after the U.S. stock market put in a bottom, but it returned to the public markets in June 2015. During that interval, the company cleaned up its balance sheet and transformed its business to be less cyclical and more focused on higher-growth emerging markets. China and India accounted for 23% of its revenues for the 12-month period ending Sept. 30. That story has apparently been unable to erase the taint of a prior bankruptcy: At $12.67, the stock lies more than a third below its $20 initial public offering price, and it has never closed above $22! But the good news has been obscured by a restructuring process that has weighed on Milacron's earnings since its return to the market. Moving some production from Germany to India, for instance, is a costly process. The company estimates that its final year of restructuring amounted to $55 million. But that three-year process is on track to end next month, making it a good time to reexamine Milacron's prospects. Last month, the company announced a two-year, $125 million stock repurchase program, which represents 14% of the current market capitalization. As the company shrinks its share count by scooping up undervalued shares, the cash flow yield will rise. I gave Milacron a preliminary once-over and noted that the board of directors and executive management appear to punch above their weight for a company of its size; furthermore, they understand the notion of competitive advantage, which is key. Plastics manufacturing and processing may be a humdrum business, but I find Milacron's story compelling enough -- and one the market will find increasingly difficult to ignore if the company continues to execute.